1st Battalion, 2nd Marines (1/2) (pronounced "one-two") is an Infantry battalion in the United States Marine Corps based out of Marine Corps Base Camp Lejeune, North Carolina, consisting of approximately 900 Marines and sailors. They belong to the 2nd Marine Regiment as a part of the 2nd Marine Division. 1/2 was activated on January 1, 1933, at Camp Haitien, Haiti and spent the next year and a half in Haiti until its deactivation in 1934. 1/2 was reactivated in June 1942 deployed to the Pacific theater of World War II. While there, the unit participated in the bloody "island hopping" campaign, fighting at Guadalcanal(where they were the first Marines ashore), Tarawa, Saipan, Tinian, and Okinawa. After the war, 1/2 spent a brief period on occupation duty in Japan, including Nagasaki, before returning to Camp Lejeune where it stood down in November 1947. Reactivated again in October 1949, the battalion has since regularly deployed to the Caribbean and Mediterranean regions. 1/2 has seen operational service during the Cuban Missile Crisis (1962), Dominican intervention (1965), operations in the Persian Gulf (1987 and 1988), Eastern Exit (Somalia evacuation, 1991), Desert Shield and Desert Storm (1990–91), Haitian refugee (1992), Somalia (1993), and Cuba (1994), Operation Noble Obelisk-Freetown, Sierra Leone (1997). The unit has also deployed with the Unit Deployment Program and Camp Lejeune-based MEUs. 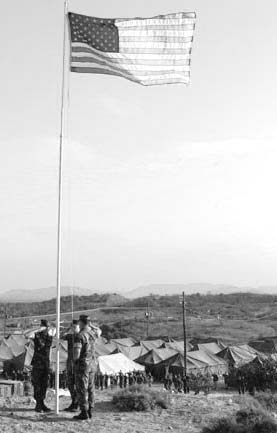 In December 2001, the Marines of Bravo Company were recalled off of Christmas leave after completing their six-month Unit Deployment Program (UDP) to Okinawa. The Marines were sent to Guantanamo Bay Naval Base, Cuba to provide security for the Guantanamo Bay detention camp, including Camp X-Ray. The battalion saw combat during Operation Iraqi Freedom as part of Task Force Tarawa in 2003 and with the 24th Marine Expeditionary Unit in 2004, having combat operations in Iskandariyah, Musayyib, Haswa, and Jurf Al Sakhar, located in the Babil province. In the summer of 2006, the battalion completed their third tour in Iraq having combat operations as part of the 22nd Marine Expeditionary Unit in Hīt located within the Al Anbar province. In March 2007 the battalion on its 4th combat deployment operated in Kahn ar Bagdadi, Ar Rutbah, Albu Hyatt and Anah, located in Al Anbar province. From July 2008 through February 2009 the battalion deployed to Al Habbaniyah in the Al Anbar province. The battalion also spent a portion of its 5th deployment to Iraq in Sinjar, located in the Ninawa province. The battalion deployed to Afghanistan in support of Operation Enduring Freedom in March 2010. Their area of operations (AO) included Now Zad, Salaam Bazaar, Karamanda, Kunjak, Musa Qala, Allahu Akbar, and the Musa Qala Wadi down to Sangin. The battalion took heavy casualties but was able to push out a large portion of the Taliban in the AO and double the size of the AO that they were responsible for. For their exceptional actions, First Battalion Second Marines, along with several attachments were awarded the Navy and Marine Corps Presidential Unit Citation. 1/2 came home in late September 2010 when they were relieved by 1st Battalion 8th Marines. 1/2 deployed again in support of OEF in April 2014. The Marines and Sailors patrolled the surrounding area of the Bastion-Leatherneck complex to ensure the safety of coalition forces operating on the bases until full security responsibility of the area was transferred to the Afghan National Security Forces in October 2014. 1/2 was the last U.S. ground combat unit on Camp Leatherneck, flying out on helicopters hours after control of the base was transferred to ANSF. Marines and Sailors with Bravo Company, 1st Bn, 2nd Marines, conduct a security patrol near Camp Leatherneck in Helmand province, Afghanistan, August 23, 2014. Justin LeHew, recipient of the Navy Cross for action during the Battle of Nasiriyah in 2003, and the Bronze Star for heroic actions during the Battle of Najaf in 2004. Wikimedia Commons has media related to Category:1st Battalion 2nd Marines. ↑ "Two NC-based Marine battalions going to Iraq". WWAY NewsChannel 3. http://www.wwaytv3.com/node/744. .